Yes but they are pretty nasty to me. Don't mess with the berries unless you can stomach them. The berries would fall into that edible but not so palatable category. Also be careful about picking them because they now have laws in place as folks are getting them for the prostate pharmaceutical industry. The laws are meant to control the collection and sale of the berries. So no berry pilfering. And watch out for rattlers. In a modern day twist the saw palmetto berries have several medical application so this “irksome” weed is a $70 million or more business in Florida. They’ve even had to pass laws to prevent unauthorized saw palmetto berry pilfering. Has a $500 fine. We now know saw palmetto berries have a positive effect on the male reproductive system, though the studies are mixed. There is also a ton of what I always thought was chickweed, but several websites have told me it is not. Bordering the property is a large undeveloped expanse of hardwood bottoms with a large creek. I haven't trespassed back there, but in the event of needing to trespass, I bet I could find mushrooms in season and a white oak somewhere. I could probably survive indefinitely by foraging in my back yard. Only problem is I rent. In the apocalypse, will my landlord let me stay? Edit.... Add Wood Sorrel to the list. A good bit of this out there too. What is this? This picture is supposedly Chicory, and I have this in the yard, but another site says Chicory has no hairs on the leaves. Mine have hairs. Leaves - Rosette leaves are 2 to 6 inches long, oblong or lance-shaped, and covered with rough hairs on both the upper and lower surfaces. Margins of basal leaves are either deeply dissected with pointed lobes or they may be shallowly toothed. Stem leaves are small, sparse, alternate (1 leaf per node), lance-shaped, and clasping. Stem leaves have smooth or slightly toothed edges. Is Wildman Steve Brill wrong???? With white, milky sap, it looks like its edible relatives. However, the dandelionís larger, sharper teeth point to the leaf base; and wild lettuceís finely hairy leaves contrast with chicoryís hairless leaves. Without poisonous look-alikes, chicory is a good target for beginners. Just make sure there aren't any pesticides or herbicides on your yard. My problem is I live where sodded yards are required and they get sprayed. I would not want to eat anything from the yards around here or anywhere that there may be pollutants. I go the woodlands for wild edibles and "most" (not all) of those urban and suburban "household" wild edibles just are not out in the wild woodland. I am not familiar with Chicory so I would not know. That would be a good question for Deane. Anybody know of a good spot to go mushroom huntin around Valdosta or anywhere around that area. Adel, Cecil, etc. I have decided this Morel thing is a cruel hoax by Nature to punish the foolhardy souls gullible enough to trek miles thru the woods with their eyes glued to the ground. Furthermore, I would like to go on record that I am certain the reports online about finding these critters are simply disinformation put out by Leprechauns protecting their "Gold Stash" at the end of the rainbow. Finally, this guy puts up a pic on Facebook, and the "choice edible" is the size of a copper penny. How in the world can you see such in leaf litter from six feet up in the air? I have searched Bogart woods for two solid days and have yet to find anything resembling a "Morel". I did however find a couple of Agrocybe praecox. Supposedly this is edible, but with my current run of luck I decided to pass. If there is a kind soul out there that has really found one of these mythical creations anywhere near Bogart, please share with me your experience. Especially as to how and where to look for the bugger. The Wood Sorrel came up/bloomed this week, tons of it, I tasted it while doing some yard work this morning and it was nasty. Very bitter compared with the other wild edibles in the back yard mentioned above. I also found a large patch of white violet. Google says they are a local rock band, and also a type of Violet. I assume they are edible too? Just like the violet Violet? Update- Yes, they are edible and taste great. Are water oak acorns edible? I think most acorns are edible in the strictest sense of the word, but are they desirable like white oak acorns? I have found it impossible to google because of the word "water" in the search term. Hundreds of results of prepping acorns in water, but nothing on water oaks specifically being edible. Any info yall can provide is appreciated. Water Oaks are in the Red Oak group and are very bitter, probably from high tannin. 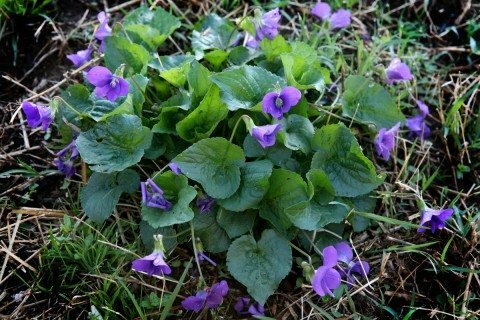 In your yard you should find Chickweed and Purple Deadnettle based on the other plants you have shown. Both edible. Wood Sorrel makes a nice pleasant tea. I have a Laurel Oak in the backyard and its a member of the Red Oak family. It is the only one I know of that has little to no tannin in the acorns. I can eat them off-hand but I am sure it still has "some" tannin in them. Even so they should be leached. Most Red Oak acorns are full of tannin and bitter. One way to tell the amount of tannin in an acorn is to look at the acorn cap size. The rule is the bigger the cap the more tannin. This rule seems about right to me given all the acorns I have run across. I have read that the tannin in some Black and Red Oak acorns may not ever leach out no matter how much leaching is done. Laurel Oaks are difficult to distinguish from Live Oaks. Live Oaks have a very mild acorn. Regarding chickweed, I was convinced I had a ton, but a closer botanical examination with the help of some reputable extension services online, it's actually a close relative of chickweed. Mine doesn't have the single line of hairs on the stem. The hairs are randomly distributed. But otherwise, looks just like chickweed. Regarding purple deadnettle, I had first mis-identified henbit as purple deadnettle. It wouldn't surprise me if there was alot more edible out there, yet to be identified. 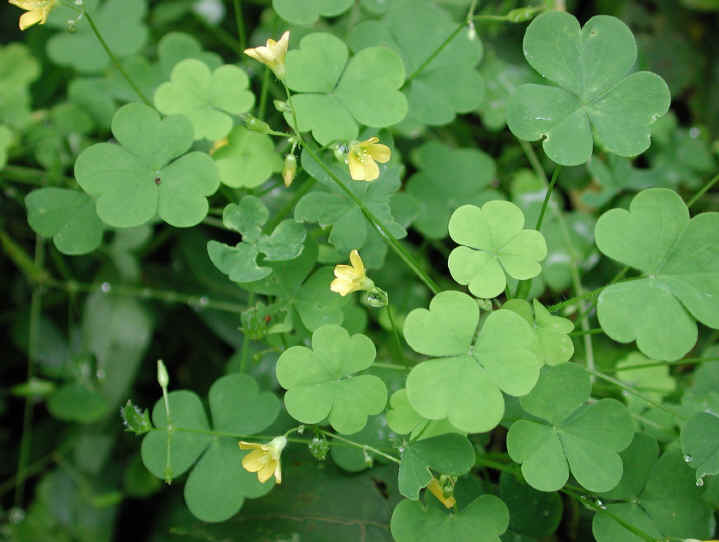 Regarding Wood Sorrel tea, the oxalic acid content raises blood pressure, which would be bad for me. I'm making a tea of it today just for fun, but it's not something I need to be consuming very often, I don't think. However, my wife has low blood pressure, so maybe she'll partake more often. Thanks for all the info yall. Update- The Wood Sorrel tea was excellent, and not bitter in the least. Stems, leaves, flowers. Made a little over a cup. With a little sugar, it had an almost rhubarb jelly type of flavor. Wife liked it too. She was skeptical. There are several species of Chickweed. I have a good bit of Shepherd's purse, wild lettuce and some dock mixed in. Also Creeping Charlie, Mallow, dandelion, white clover, and lots of wild garlic/onions. Yellow Pine. Cambium or inner bark and needle tea. Link included in the video description. Will post this in the forum also. Plenty of Live Oaks around also. But I do know the difference. Laurel Oaks have a very mild acorn also. As I said, I have one in my backyard. Harvested the first Greenbrier shoots today, and the chip bed that I innoculated last year has Winecaps poking thru all over it. Waiting on the Lambsquarter seedlings to appear so I can put in my Lambsquarter garden. We ate at least ten times last year off of about 12 plants or so that I transplanted. The rain is coming, the temp is rising, I got a Meadow Mushroom this week, everything is looking up. Have yall ever prepped the Greenbrier roots? Ditto to waddler. Kind of on par with processing Cattail roots for flour. Too much work. Winecaps from the garden. Seeded these in last fall.